They say variety is the spice of life and on this tour of Cincinnati’s highlights, you’ll have to agree! Your adventure starts at the historic Findlay Market, where you’ll be led past tantalizing local produce, fresh meats, and bakery goods. Before departing, we’ll stop for a tasty treat or two of the locals’ favorites. Leaving the market, we’ll hop on the sleek and modern streetcar for a short ride to one of Over-the-Rhine’s favorite areas, Washington Park. Amid the beautiful architecture, historic landmarks, and playful water features, we’ll hear about the amazing revitalization of this area. Then, all aboard the streetcar again, to the heart of downtown, where we’ll tantalize your taste buds with another taste of Cincinnati’s local favorites. You won’t be disappointed — the locals who flock here never are! Next up, hold onto your hat as we quickly ascend 45 floors to the observation deck of the Carew Tower for fantastic views of Cincinnati, Northern Kentucky, and, if we’re lucky, Indiana. 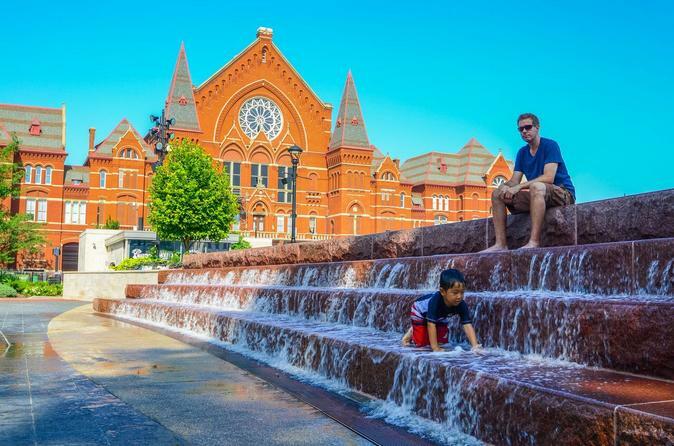 From there, after strolling through the delightful Fountain Square area, we’ll walk three blocks to The Banks riverfront development, complete with trendy eateries, a riverfront park, and home to the Cincinnati Reds and Bengals. Then, at the National Underground Railroad Freedom Center we’ll have a once in a life-time opportunity to touch a piece of the Berlin Wall. A few steps away, one of Cincinnati’s most beautiful and fun-filled riverfront parks begs to be explored. We’ll meander through its gardens and quirky water features with the mighty Ohio River as our backdrop. Our tour will end here, but don’t worry, your streetcar ticket is good for the remainder of the day, so you’re free to explore more of the city at your leisure.